I've added another six+ layers, mostly in the blue and purple hues. In the meantime, I have been drawing several other pieces to work on while I wait for each layer to dry. You'll see some of those interspersed with these two pieces. When I head on a trip I like to have a book to read. Rarely do I have the leisure time to peruse the various offerings at my local book store ahead of time. This means that I am usually grabbing a book at the airport and hoping I will enjoy it. The latest "grab" was on my trip to Spain. On a quick layover in Seattle I found the novel The Art Forgery by B.A. Shapiro. I was so busy on the trip that I had only 30 minutes to start it but I did dive into it on the long flight home from Amsterdam to Seattle and on to Spokane. Wow. Really a very fun read for an artist or one who likes art. 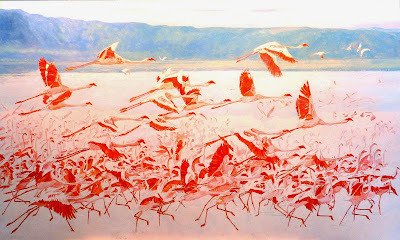 And, it inspired this next set of paintings. No, I am not going to forge a Degas. I checked out Gamblin's Galkyd Gel but opted for the old standby, Liquin. Mixing a little paint in with liquin, I have been adding layers of paint. They dry enough for me to add a layer in the morning and then one in the evening. Below you can see the beginning of these pieces. 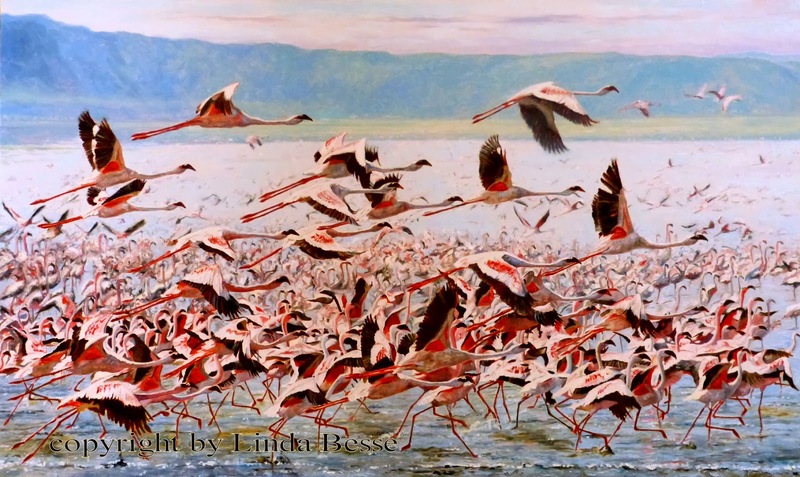 Each painting is 36" X 15." 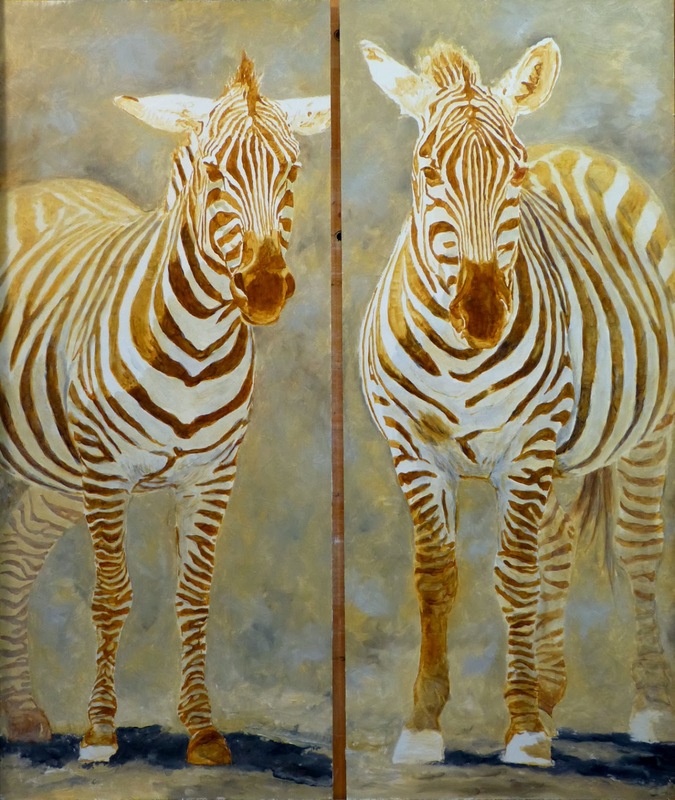 The zebra were first defined with my standard raw sienna - burnt sienna turpentine wash and now have about 8 layers of glazing (with 20? 30 to go?) The background colors were mixed directly from the tube and applied with no medium. 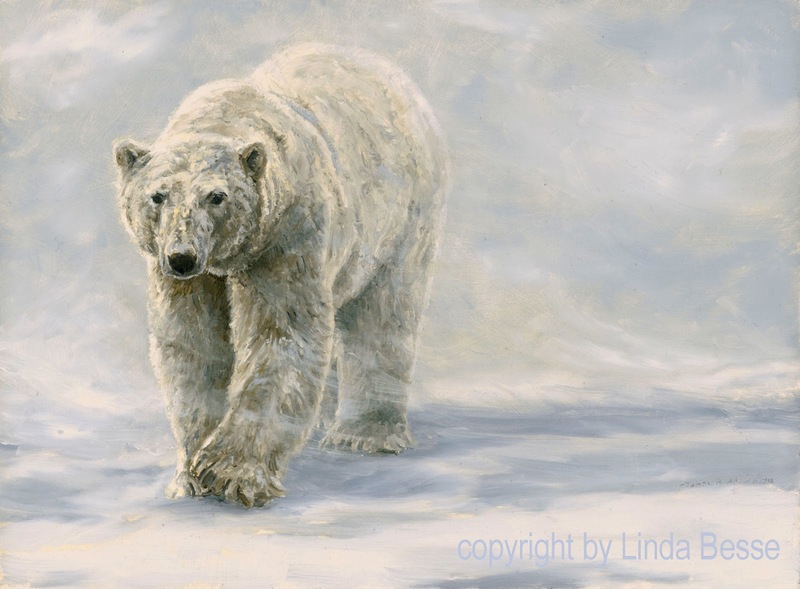 In light of this brisk weather, I have a new painting to share. 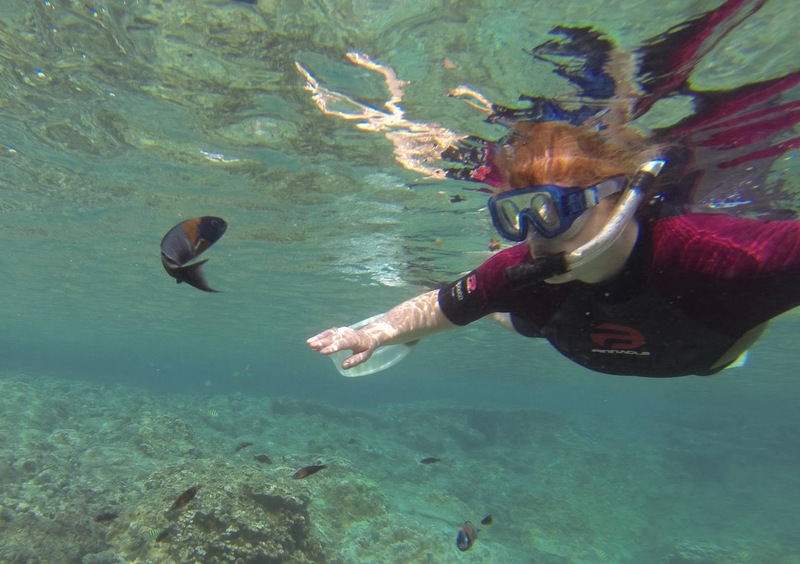 My two weeks on the Big Island of Hawaii afforded some of the best snorkeling I have ever experienced. There were more green sea turtles than ever before. Watching them feed in shallow water never grows old. I was also in a bay snorkeling with 50 - 60 wild spinner dolphins. Hard to keep your distance when they kept swimming up to you. What a thrill! The sun is shining here in Spokane and the temperature is almost up to 18 F. Quite a change. Stay tuned for some new paintings. As I work my way down the piece, I am painting the main birds and working in the background birds. Usually I would be painting one completely, then the other. I thought working on them together would help create a more seamless feeling of distance. 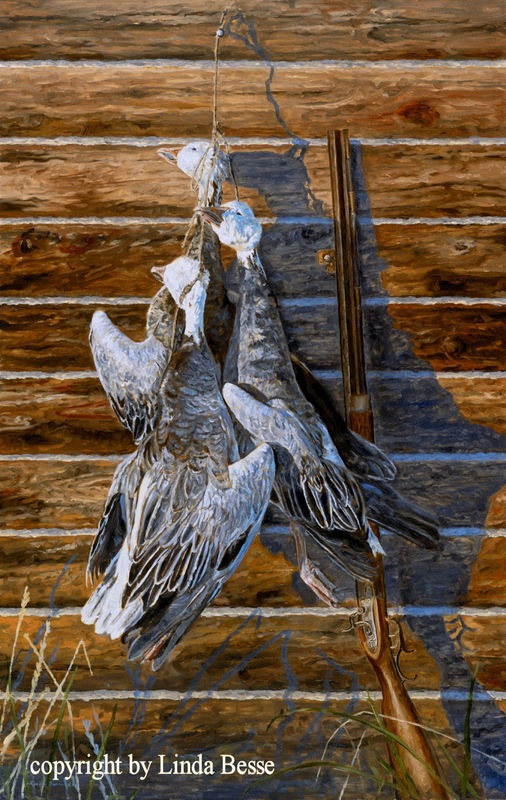 Usually I would save painting the most detailed birds for the end. In this piece I decided to work on them first and establish the movement I want to portray. Once I have them in place, I'll start playing around with the softer flamingos in the background. 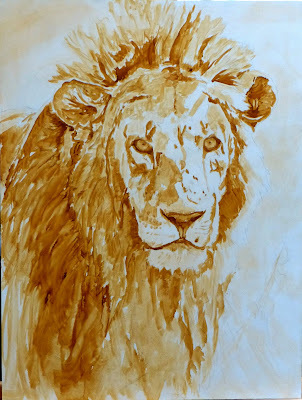 For years my turpentine underwash has been a combination of raw sienna and burnt sienna (leaning heavily on raw sienna.) I thought a cooler (less warm) and more intense underwash color would enhance this painting. Seeing the color in my head, I went to my local professional art store, Spokane Art Supply, to take a look. The first color I saw was "it." 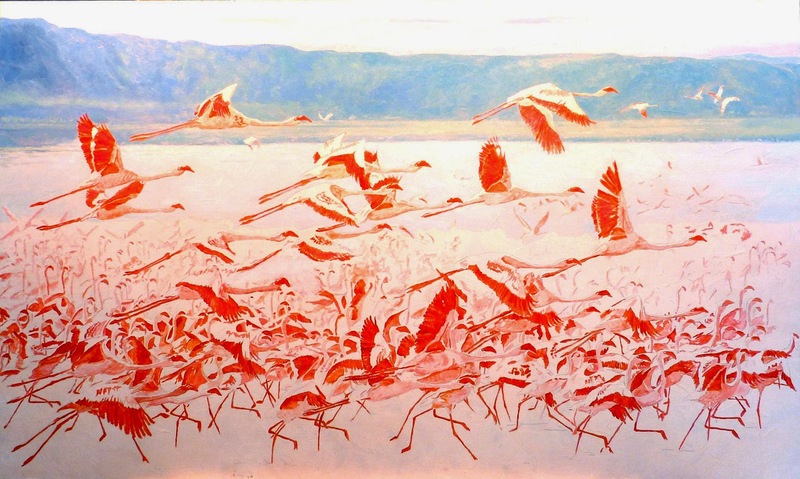 A Daniel Smith Quinacridone Coral oil paint. I knew nothing about this color or how it would work, if it would work, but it looked right, at least on the outside. Plunking down almost $20, I left the store ....hopeful. 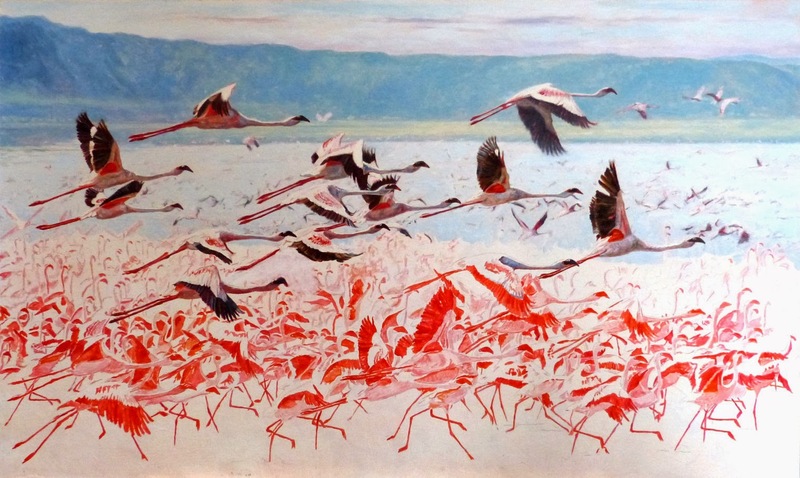 After spending a lot of time drawing out my piece (when you see thousands of flamingos take flight, which do you choose for the right composition? ), I was ready for my experiment. My first thought when I put some paint on my palette is that the color had the right intensity and coolness. With a little bit of cadmium orange, I think it will work. 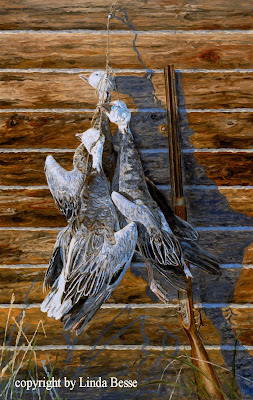 After roughing in the background I was ready to start on the birds. My first bird finished, all I could think was "what was I thinking when I switched from my usual underwash?" The color is SO bright. I forged on. By my fifth bird, my doubts were still there but I was determined to see this experiment through. The underwash is meant to peak through and I wanted a vibrant color. When I finished, it was bright alright. Almost distracting. The right choice? Yes, I believe so. Below you can see the finished wash and the start of the background. When I began this painting, I knew it would be a different approach for me. With a very subtle and abstract background, the goal is to make the main subjects "pop." I envisioned a taupe background color and mixed 3 different shades making the lightest color the warmest. The darkest color at the top and bottom is purposely painted moving in and out of the other 2 shades. 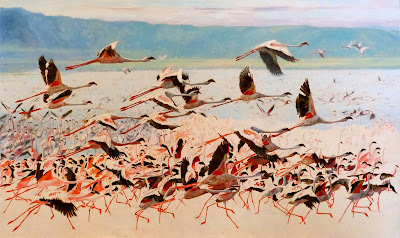 If I had painted an even gradient from top to bottom, I think the painting's movement would have suffered. 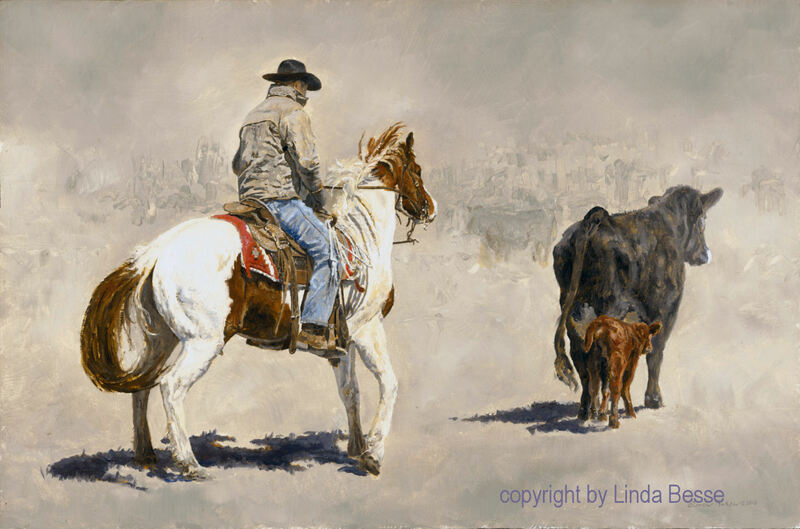 To give the painting depth, I wanted cows in the background slightly above center. Grabbing a small angle brush and the darkest of the three colors, I painted cow streaks. There is one in the center which reads more like a cow and tricks the mind into seeing more. One of my abstract groupings to the left of the foreground cowboy kind of looks like another cowboy on a horse. A happy accident. The background center cow still needs a tad more definition, but I will wait until the cowboy and horse are painted. There are collectors, galleries, and artists who are proponents of a limited genre for an artist. 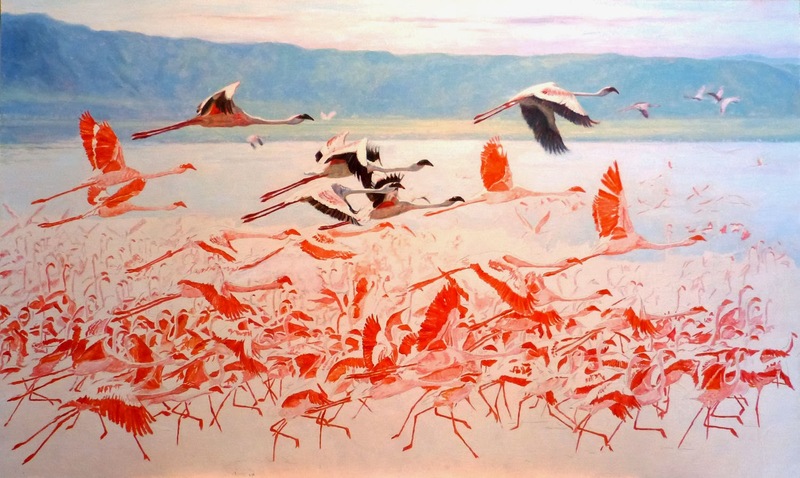 You are a wildlife painter, a western painter, a landscape painter, a sporting dog painter, a still-life painter, etc. Pick one, maybe two of the categories and you will be safe. Everyone will understand your "brand." For me, I don't think painting should be safe. 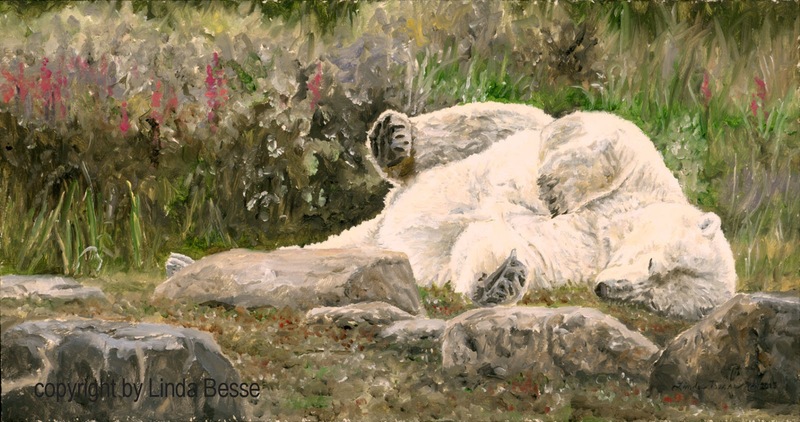 While I am mostly thought of as a wildlife artist, that is not how I look at it. I don't think of myself as an artist who paints wildlife, but rather as an animal lover who paints. 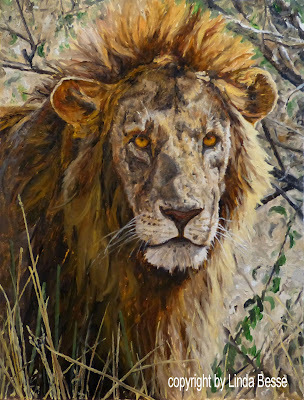 There are also other subjects which grab my attention that I want to capture in oil. 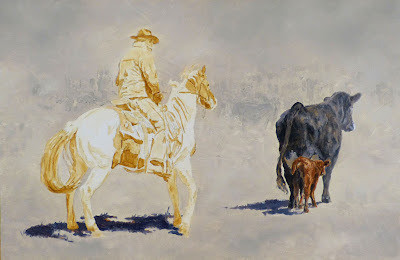 Below you can see a "western" painting I am starting. For me, it is not so much a western painting as it is a story which I wanted to share. First, the posture of the horse intrigued me. My initial thought was to put a rattlesnake on the ground in front of the horse. On second thought, my lack of good rattlesnake reference (is that a good thing?) cancelled that idea. What about some cattle? In looking through the reference, one image stood out. A cow and newborn calf. Once I mirrored them, the composition fell into place. 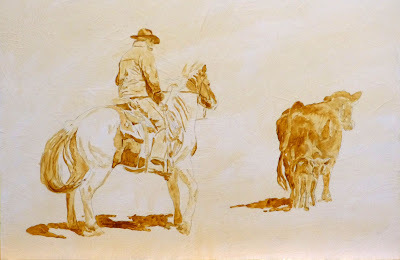 Below you can see the raw sienna/burnt sienna turpentine value study. This question has plagued artists for centuries. Is there too little detail? Is it too dark or too light? Does the hue reflect the mood? And you could probably add a dozen more questions. I "finished" this painting and signed it. The next morning, the thin background tree was bothering me. So, I took it out. The more I looked at the piece, the more the background bothered me. I made the mountain more purple-y from its brighter blue and painted in a lot of trees. Finished. Hmm. Still not right. OK, time for some drastic modification. I grabbed my palette knife (which I only use to mix paint) and scraped off a large section of background. I thought moving the horizon line down would add focus to the cat. Painting in more sky, I also softened the mountain/sky intersection. Now to the rest of the background. I had originally painted in some light greens which while pretty, did nothing for my new plan. Out they came. A lot of dabbling in the background, trying various colors. Every few minutes I would step back to look at the piece. My mind was starting to fill in background objects from slight hints of shapes. Yes, this is the right direction. I continued to play with colors and textures until I was "finished." It can be a little scary to scrape off a thoughtfully painted section, but I have learned to not fall in love with my own brushstrokes. 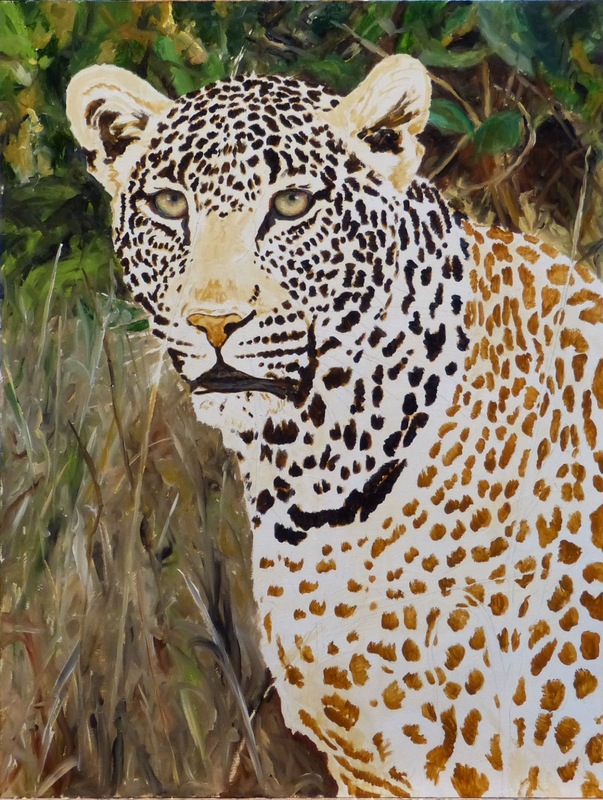 The end result is what I am after and if that means altering my carefully developed plan and working by intuition, the palette knife is there to help. Though my husband and I have lived here for almost 26 years, I never tire of the wildlife I see. 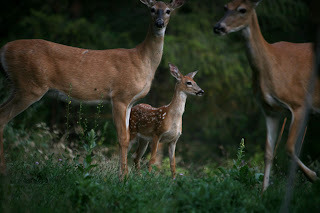 Almost every day we see deer and I smile each time I see them. 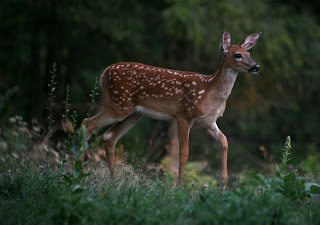 I took these photos last evening standing in my drive looking into my side yard. When I paint during the summer, I like to challenge myself. Dare to create the unusual. Granted during the rest of the year it is important to stretch, but during these hot summer days, why not turn up the heat in the studio? A fun direction is to turn a grand scale idea into a miniature painting. Yes, this piece took me much longer than a work this size normally would and there were times (maybe on the 37th wildebeest) that I did wonder what was in the water when I came up with this idea. In the end, I am pleased with the result and the painting is slated for an upcoming miniature show and sale. 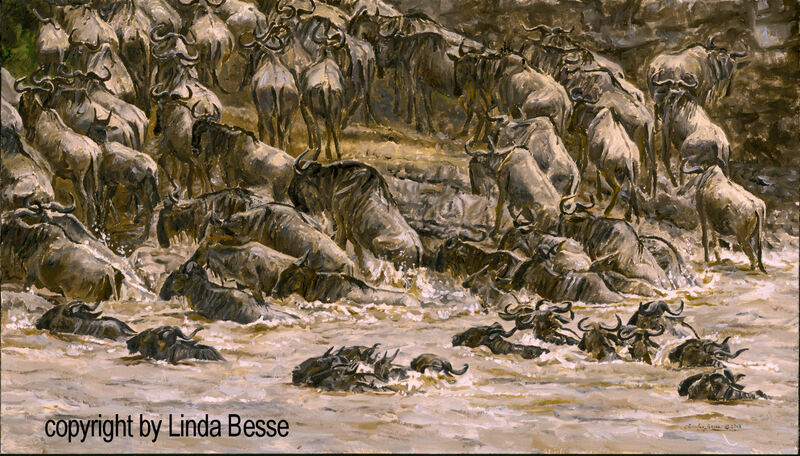 Bet no one else in the show will have painted 64 wildebeests! This male leopard was one of my favorites of the nine I saw on my last trip to Africa. He was trying to gain the favor of an aloof female and his amorous attentions finally won her over. 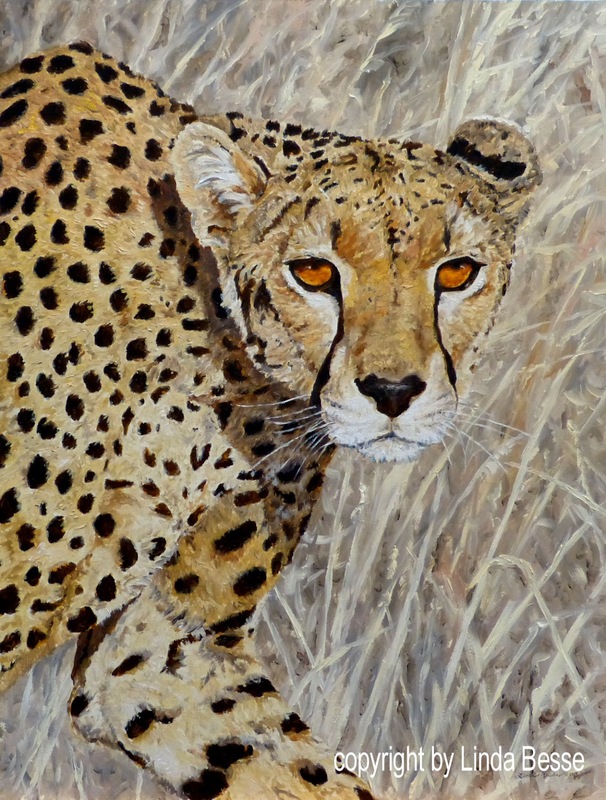 The completed African Big Cat Trio below, which will be framed individually, will be available at the Safari Club International Convention at the Mandalay Bay Convention Center in Las Vegas, February 5th - 8th, 2014. 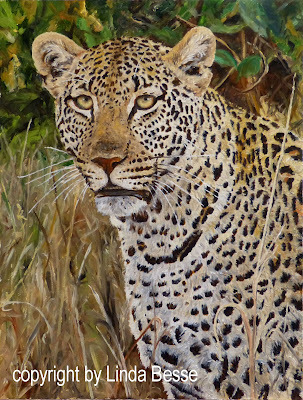 For the last in this African Big Cat Trio I have the leopard. 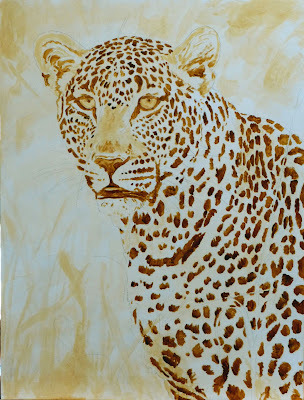 Maybe I shouldn't have a favorite animal, but I have an particular affinity for the leopard. The power, grace, and beauty of this cat coupled with its secretive and adaptive nature fascinate me. I certainly remember this lion. He was a magnificent male in the Masai Mara with battle scars illustrating his victories. At the time I saw him, he was with a lioness and they were ready to start the next generation. There was no doubt in my mind that he was king of the beasts. Note: If you compare this to the last post, you will see I took out a stick in the lower right. It was distracting and needed to be edited. As with the cheetah, I have fixed the eyes on the viewer. The pupils are small giving one the impression the lion is not happy to see you. When painting animals, I spend a lot of time painting the eyes. A slight change can take a friendly cat into one afraid, hurt, hungry, satiated, territorial, or angry. It helps to have spent time in the wild with the big cats and watch emotions play across their faces. 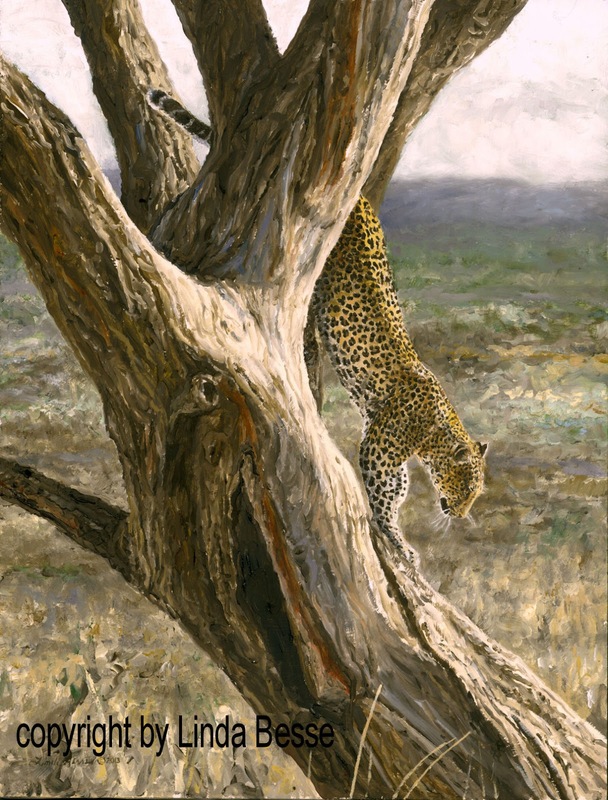 Wild cats are one of my favorite creatures to paint. So with a trio, I am in heaven. For this set, I wanted intense eyes in the three paintings. The best way to accomplish that is to use a trick of visual perception. With the eyes focused directly out of the painting, they will appear to follow you regardless of the angle you view the painting.﻿ Just try it, move your head back and forth while looking at the screen. (click on the image for a larger view.) 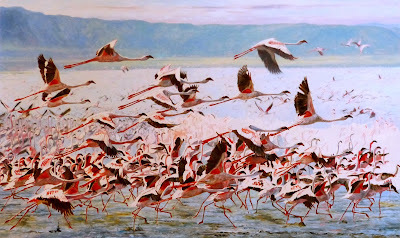 The effect is even more prominent when standing in front of the oil painting. 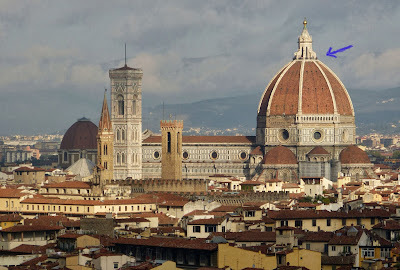 This "trick" has been around for centuries and used by many Renaissance painters. Most notably by Leonardo DaVinci in his painting, Mona Lisa. Though you know you are looking at a flat surface, your brain creates a 3-D interpretation (at least if the painter works the lights and darks well.) You expect the eyes to stay focused perpendicular to the painting surface and when you move to the side your brain tells you they should look different because that is what happens in real life. But the painted eyes haven't changed. Your brain continues to create a 3-D object from the 2-D plane regardless of the viewing angle making the eyes appear to be following you. This visual trick works particularly well on predators and I think best on the big cats. 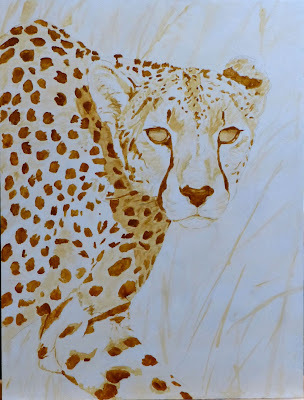 I thought I would start with the cheetah. This piece will have the most muted colors of the three but I hope will be just as dramatic. There will be more detail added to the face/head. Once I finish the rest of the coat, I will revisit the head, add the "white" around the mouth and add the whiskers. More texture and depth in the face and some warmer colors will help the cheetah stand out from the background. I have started on the Big Cat Trio. Each painting is 21" X 16". 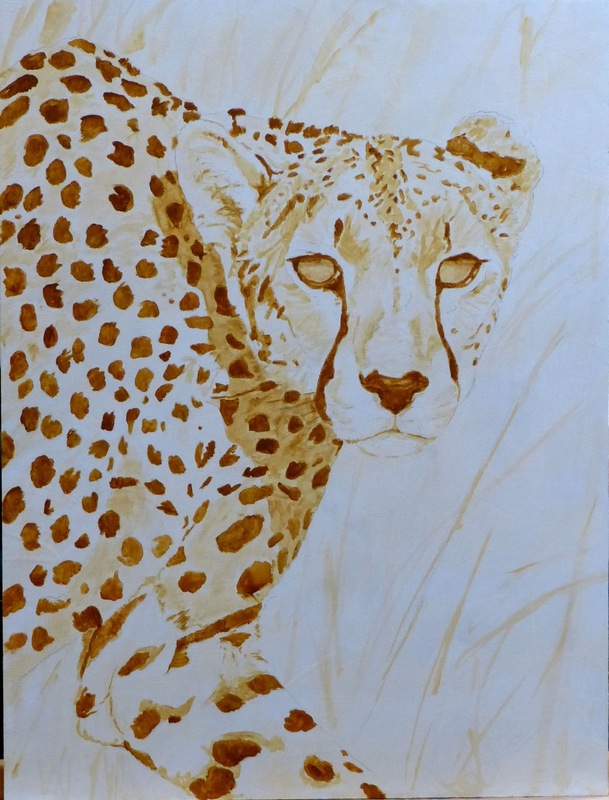 Below you can see my raw sienna/burnt sienna turpentine underpaintings for each piece. I'm not sure which cat I'll paint first. As promised earlier, here is the completed SCI Foundation 2014 Conservation Artist of the Year painting. 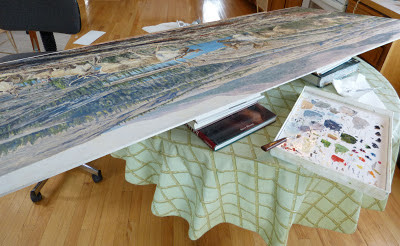 Yesterday I went over to my printer’s in Coeur d’Alene, Idaho and picked up the painting after scanning. Scanning is a tricky business. For a piece this large, especially so. On my printer’s machine, the painting is placed face-up on the scanning bed. The scanning unit which is attached to an arm over the painting (not touching it), moves back and forth capturing all the detail. Since the scanning bed is 36" x 48", two scans were made which were then spliced together. Yesterday was my chance to review the scan and the scanning master made changes accordingly. My goal is to match the painting and make sure the giclee prints capture the colors and details I painted. By moving back and forth between the scan on the monitor and the painting, we made several slight adjustments to hue and contrast and added a little gamma correction. With that accomplished, proofs will be printed for me to review. I have set aside a day next week to spend at the printer’s to review the first proof, make changes, print another proof, make changes, etc. There have been times when it has taken a dozen proofs to arrive at the perfect result. As a painter I want an accurate representation of my work and, fortunately, the printer agrees. 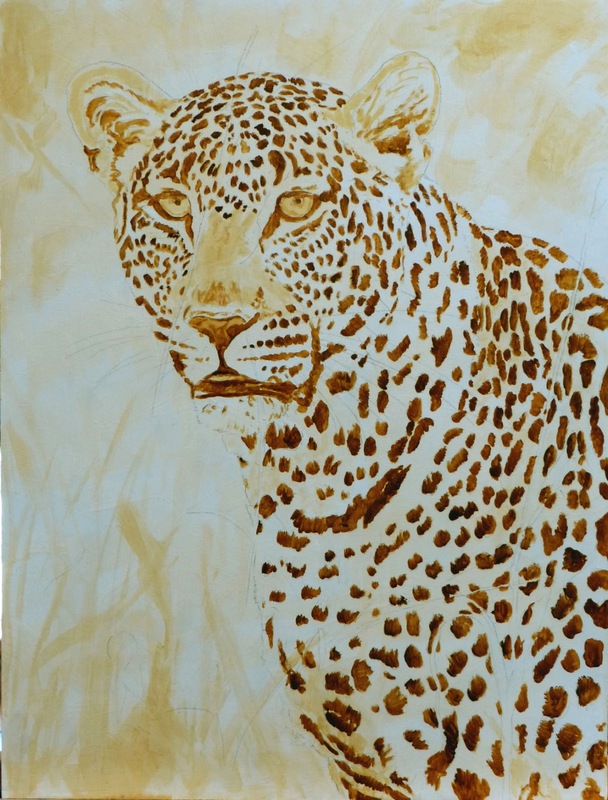 Later this week I start posting my next project, a big cat trio. 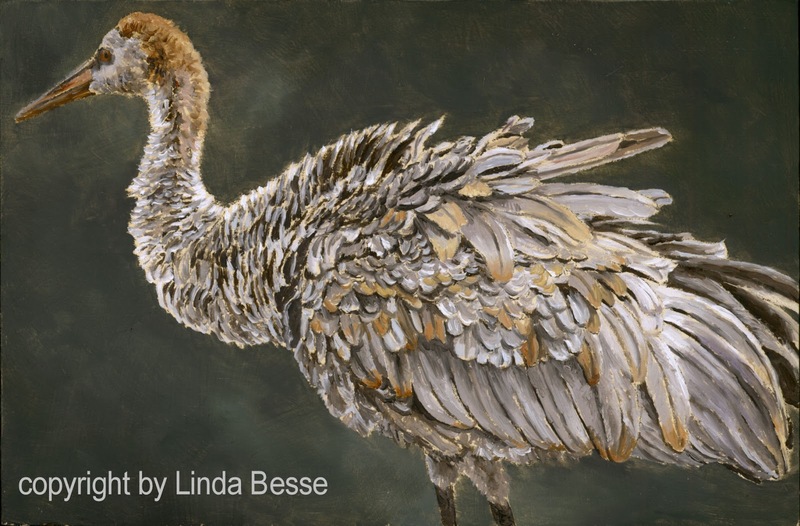 The juried Birds in Art show at the Leigh Yawkey Woodson Museum is quite an event. 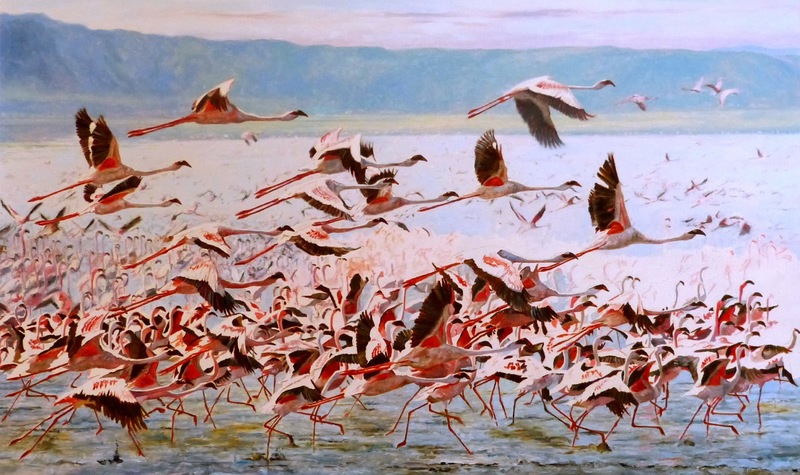 Painters, sculptors and carvers from around the world have had their work chosen for this prestigious exhibition. The Museum added a fun event several years ago. The Postcard Program. 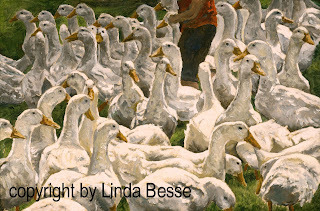 Artists in the show are invited to sketch or paint a 4" X 6" “postcard” to be sold the Friday evening of Opening weekend. Attendees wishing to purchase one stand in line, make their selection and if they wish to get a second one, they must go to the back of the line. And, the fun part? Each one sells for $50 and the artist is anonymous! Yes, we sign our name on the back, which is not revealed until the postcard is selected. 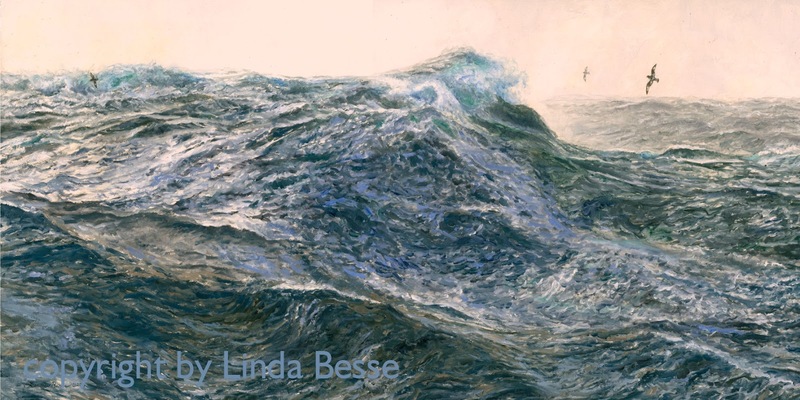 The money raised goes to support the Leigh Yawkey Woodson Art Museum and can be used to purchase work for their extensive permanent collection. 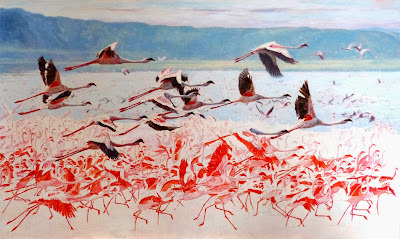 Why no recent posted paintings on my blog? I have been working on and have now finished two “postcards” and I am very happy with them. BUT, I can’t show them to you. They need to remain anonymous until after the opening weekend September 6th - 8th. I am starting a painting trio and will start posting them in several days. 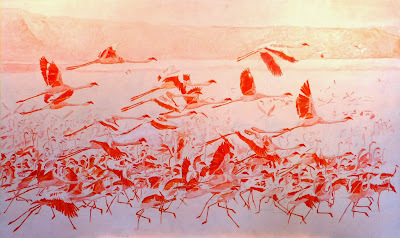 Today I am Artist of the Day with Artists for Conservation. 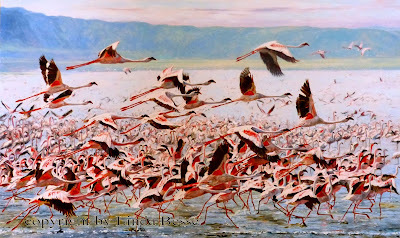 If you haven't visited this web site recently, check out www.natureartists.com. 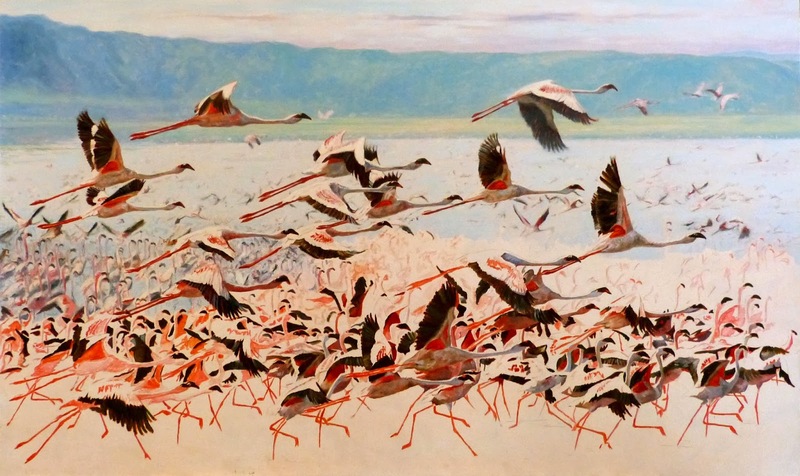 The Artists for Conservation Foundation (AFC) is a non-profit, international organization dedicated to the celebration and preservation of the natural world. 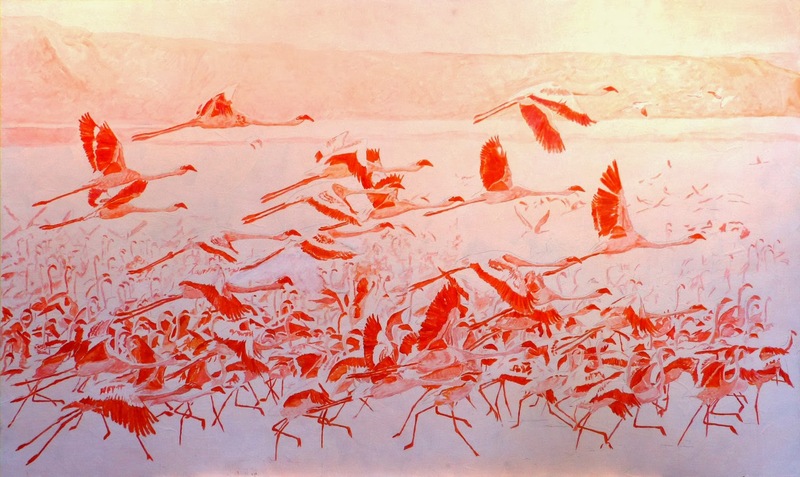 Based in Vancouver, Canada, the Foundation represents the world's leading collective of artists focused on nature and wildlife, with a membership spanning five continents and twenty-seven countries. 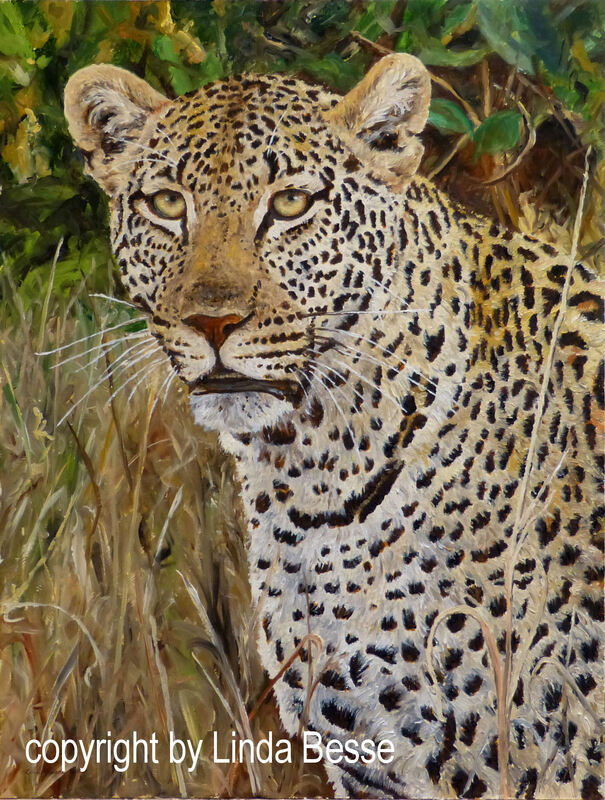 The organization's mission is to support wildlife and habitat conservation, biodiversity, sustainability and environmental education through art that celebrates our natural heritage. 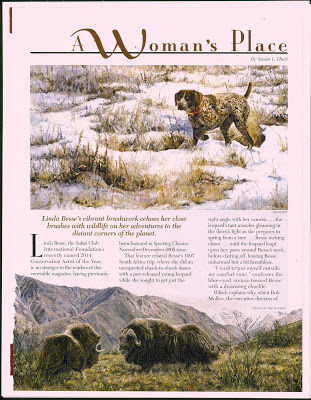 The May/June 2013 issue of Sporting Classics magazine has a very nice article on my work and some of my adventures. A warm thank you to editor Chuck Wechsler and the writer of this feature Susan Ebert. 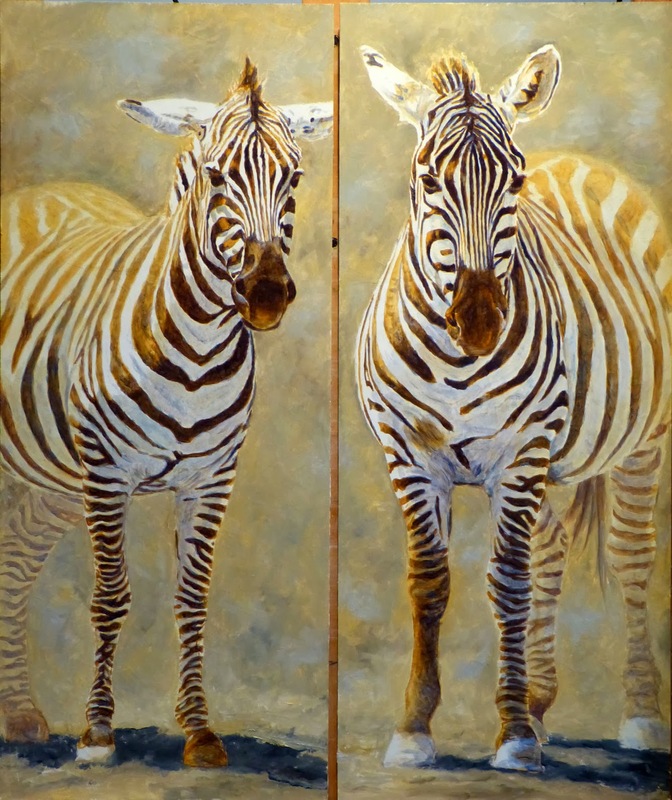 The Bennington Center for the Arts in Bennington, Vermont has had the Grand Opening weekend for three of their shows: Art of the Animal Kingdom, Small Works, and Impressions of New England. My painting Summertime Treasures in the Impressions of New England show running from June 8th to August 25th was inspired by a little girl I saw on a Martha's Vineyard beach. 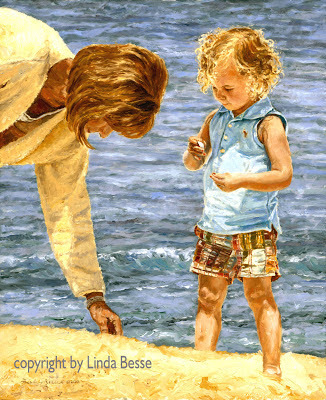 Her fascination with the shells she found reminded me of spending time on the beach when I was her age. 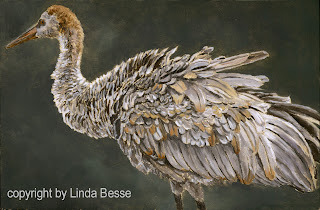 If you are in the area, swing in to see the work in these shows and to see a wonderful display on covered bridges. For more details on the show and the Bennington Center for the Arts, see www.thebennington.org. With the main part of the painting complete, all that is left to paint is the top and bottom 1/2" which have been covered by the modified easel railing. I moved the piece to my side table and propped it up on my large drawing board. Above you can see my palette as I work on the top edge of the painting. Next is the bottom edge and the signature. When it comes to signing a painting, I try to keep my signature light and relatively small. 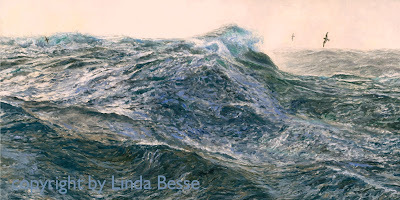 I find a large garish signature can throw off the balance of a painting and distract from the illusion of "being there" which the artist is trying to create. As for showing you the finished painting, you will have to be patient. I'll be posting it once it is scanned, sometime near the beginning of July. At that time I will also reveal the title. 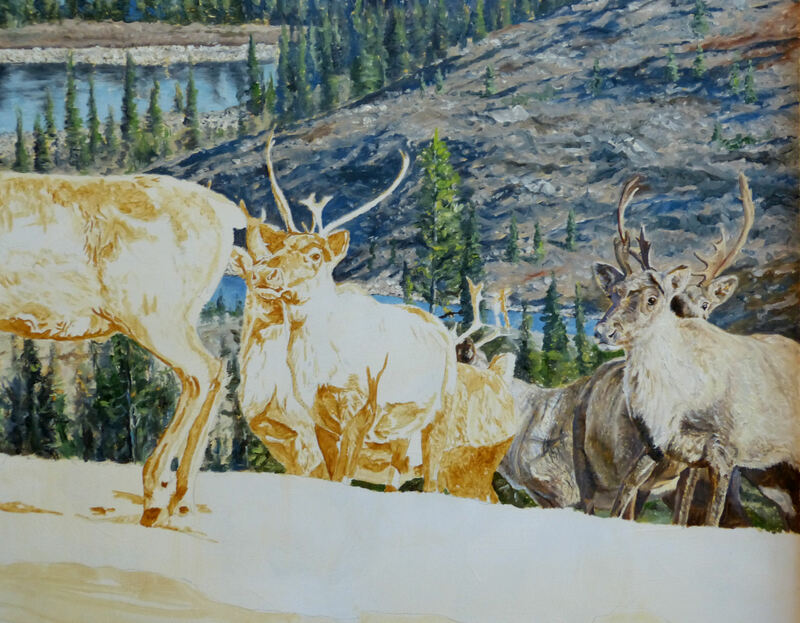 Thank you for following along as I worked on this 2014 SCI Foundation Conservation Artist of the Year painting. It will be auctioned at the SCI Convention in Las Vegas next February. Now it is time to work on painting ideas. You probably won't be surprised that I will be thinking small for the first several paintings. As I was eyeing painting the foreground, it looked too white to me. Yes, it had a burnt sienna - raw sienna wash, but it was too light. So, last Thursday evening I grabbed cadmium orange and alizarin crimson and did a turpentine wash over the entire foreground area. 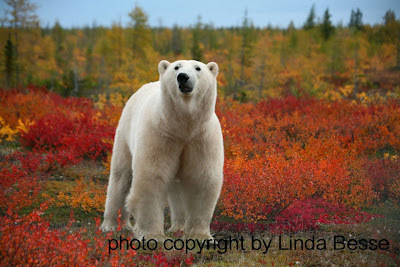 My thought was this bright color would show through and create pockets of the brilliant reds of the autumn tundra. The next morning I did question my choice but after putting in the detail now know I made the right decision. There are pops of color throughout the foreground and texture-y elements which create the effect I want. 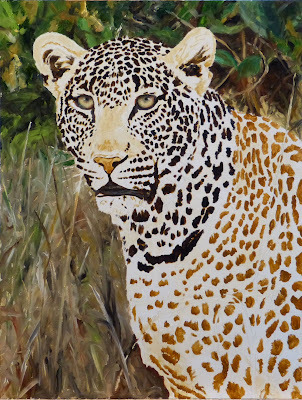 Saturday I continued working on the foreground and on Sunday worked on my list of other areas throughout the painting. There is still some work to do, especially on the big bull, but I want to call in a couple pairs of eyes from my artist friends. After working on a painting so long, enlisting a fresh perspective, objectively looking at the piece, and discussing the details, helps in adding the finishing touches. Once the painting is finished, I will have it scanned and then post it. Much of the detail is lost in taking these quick photos with my handheld camera. 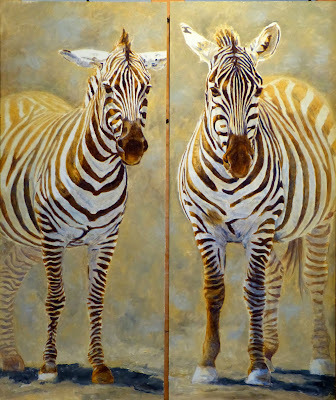 Rather than painting caribou in the Boreal Forest, I have decided to make them zebra. Just need to add a few stripes here and there......only kidding. However, I have made some substantial changes to the painting since the last post. First, for me the bigger bull's legs have been problematic. With two off the ground they didn't seem to convey the attitude I wanted. He didn't look aggressive enough. So, for several days I tried various combinations of his back legs. Now with only one leg off the ground the bull has more heft. Secondly, the bulls' heads were getting lost in the trees. Before I painted anything this morning, I went into my Paint Shop Pro program and digitally painted in more water to see how I liked it. Yes, it was working. Then I e-mailed an image of the current state of the painting and the "more water" mock-up to two close friends to obtain their opinions. Both agreed the mock-up was more effective. Thank you Selena and Lee. Next was paint mixing and goodbye to some of the forest. Don't worry, I don't think the removal of this small section of trees will drastically alter the oxygen contribution to the earth's atmosphere. There are still some more details on the large bull caribou I want to touch but I will wait until after the foreground has some color. First a quick note on the smaller bull. I saw him the same day as the background caribou on the right and left. First thing in the morning, he and a cow swam across Lake Kamistastin, Labrador and up the bank to walk right in front of us just after we left camp. Little did we know that hours later we'd run into dozens barrelling past us in a spruce forest. Now for a note on artistic license. One isn't much of an artist if one just copies a photo exactly. A common use of artistic license is to make the males look bigger, especially the antlers in the deer family. I have seen some magnificent paintings, only to be distracted by an impossible rack. I'm going to come clean on this big bull. I actually saw him! Three of us were on the far shore from camp. We had just finished our pack lunches and spotted a group of caribou on the ridge above us. Up we climb and there is a wonderful bull. Hiding behind a rock, the only sound is the rapid fire of our camera shutters and the occasional, "oh, this is so great!" Just then, out steps a monster bull. The bull we had been so excited watching paled in comparison. This big bull was a magnificent creature. We only snagged a few reference photos before he disappeared back over the ridge and we never saw him again. There was only one problem. Could we ever paint him? Would anyone believe he actually existed or would they assume we had gone wild with artistic license? That was October of 2008 and I have waited for just the right occasion to paint him. 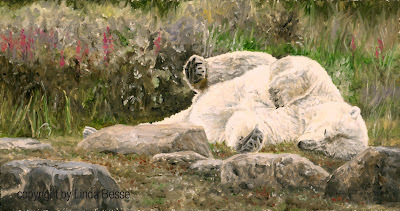 This Conservation Artist of the Year painting seemed the perfect opportunity. I'm just getting started on the smaller bull. First I began with his antlers then moved to his head. Now that I have much of the shadow in on his mane (the white fringe) I will wait to paint the "white" part until after I have some more of his body done. Why wait? 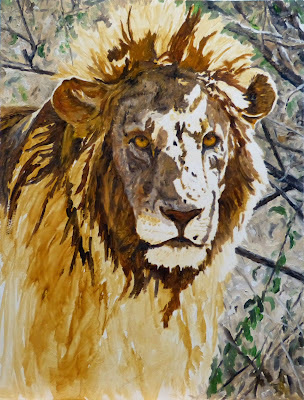 Well, I like how adding the lightest light at the end of painting an animal brings everything together. One of the challenges for a piece like this is to make the caribou stand out from the background without making them look pasted on. Some of that is done with some softer edges and some of that is accomplished with the color palette. The bulls will have warmer colors and more contrast, so will appear closer to the viewer. 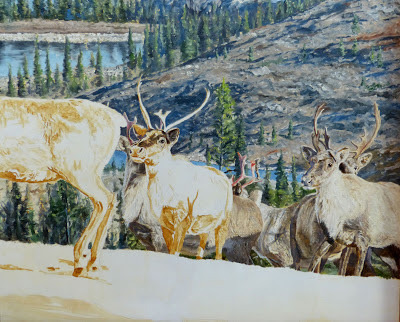 The three caribou on the left are from the same encounter as the group on the far right. The story is on my previous post. I used some artistic license for the left group. The furthest left one was with another group but I moved him here because I liked his position for the composition of the piece. He brings the center of action back to the two big bulls. The caribou on the right of the left group had its rump in shadow from another caribou. Originally I had drawn that other caribou in back of the bigger bull but decided to eliminate him so the focus could be more fully on the big bull. Next up, the smaller of the two bulls. 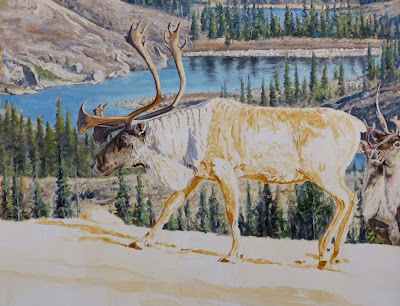 The caribou in this painting are ones I saw on three separate occasions on my WREAF trip to Labrador in 2008. The group I am working on now and the three on the far left side of the piece are from one very exciting day. We were eight artists flown into a remote section of Labrador on Lake Kamistastin the end of September. I spent most of my time with two of the artists, Cole Johnson and Steve Oliver. Early one morning, Cole and I headed off to the back country to find caribou, prepared for a long day of hiking. About 5 or 6 hours into our strenuous hike in quite hilly terrain I spotted several dozen caribou on a ridge to our right. Cole devised our plan. We were on a ridge overlooking a bowl which had a spruce forest. He thought once the caribou started moving down their ridge if we went down ours and positioned ourselves in the forest, we would be in a perfect spot to grab photos as they moved past us. 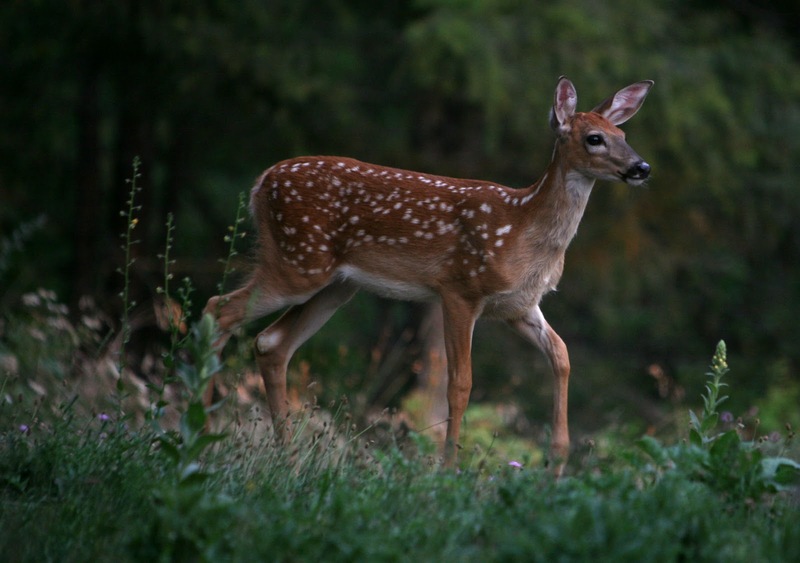 Not wanting to yell to find where he was, I just kept moving, stopping every now and then to listen for hooves. Nothing. Had the caribou gone past? stopped? turned in another direction? I kept moving, hurriedly but quietly, stopping every few minutes to listen. How much time had past? I had to take a peak to see if I could spot the caribou. There was a small slope to my right and I got down and crawled up to take a glance. Inching up I just reached the crest when the brush exploded to my left. The caribou! They were streaming past me. Caribou are not huge animals but they sure seem fairly big when you are flat on your stomach and they are moving right next to you. They are curious creatures and would often stop and look at this idiot in camouflage on the ground who whipped out her camera to photograph them. Cows, calves, young bulls, but no huge bulls. Wave after wave passed me and then more sound in the brush and a large bull almost ran over me before moving by on my right side. Now they were running past me on both sides. What a thrill! It was over before I knew it. Now, where was Cole? Did he see any of it? I chanced a quiet call out for him and to my surprise he answered right away. He was just below my little mound behind some trees and had seen the whole herd. We were giddy as we told each other our encounters and shared our digital photos. By the time we arrived back at camp it was dark. We'd been gone 11 hours and were beat. But, not too tired that we didn't want to share the excitement of being in the midst of a herd of migrating caribou. Below is one of my photos from the encounter.